Brittany Tice was raised on En-Tice-Ment Farm in Harwood Maryland. She is a graduate of Tarleton State University in Texas with a degree in Animal Business with a focus in Equine, a minor in Business. She also has an associates degree from Anne Arundel Community College in Accounting. She has been riding her whole life. 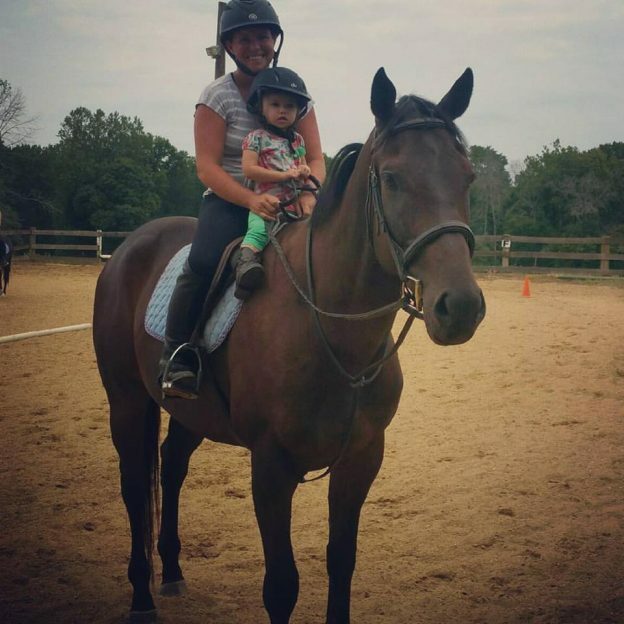 Her aunt, Deana Tice, has been her trainer since she began. Brittany has been showing since she was eight years old in classes ranging from English hunter, pleasure, and equitation, to western. She played polocrosse while living in Texas and also got a taste of barrel racing, team penning, and reining. Brittany was also on the intercollegiate team at Tarleton showing english and western. Upon graduation she was the Assistant Coach of the team. She still continues to show clients’ horses and green horses. She has been teaching lessons and helping at the summer camps for 10 years as well as training and showing green horses and ponies. Brittany is also involved with the young farmers association and the farm bureau. She also helps with the family meat business helping to raise cows, pigs, chickens, and sheep. She loves working on the farms and would not have her life any other way. This entry was posted in Biographies on January 30, 2014 by ticeadmin.